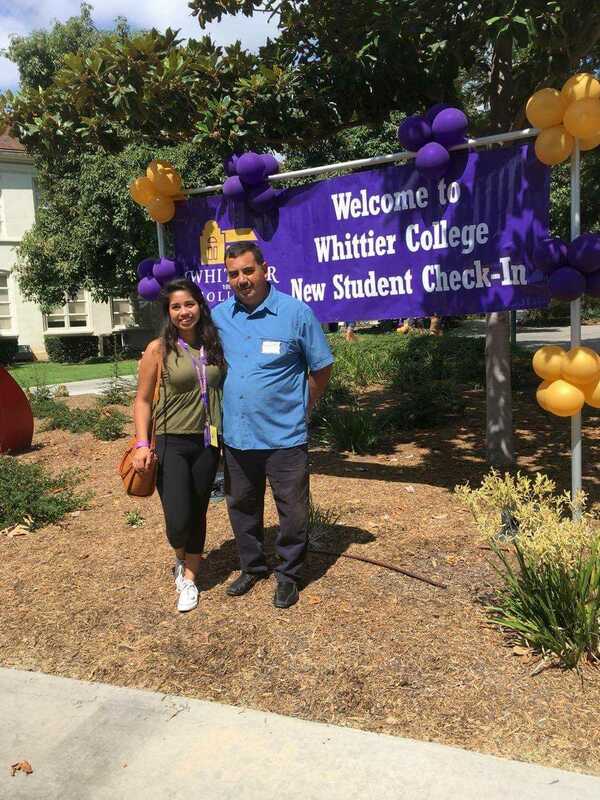 FAMILY Martha Avila-Zavala with her father, Armando Avila, in front of the Whittier College welcome sign for incoming students. Photo by Lourdes Zavala. As green caps flew through the air in June, Palo Alto High School’s Class of 2016 eagerly anticipated freedom and adventure. Just a few months ago, however, this very prospect seemed hazy and confusing to several Paly students. Even when Peter Valbuena received his acceptance into Whittier College, a liberal arts school just outside of Los Angeles, college was still a long way off. First-generation students are at risk of a concept known as “summer melt,” during which financial limitations may stop them from attending college, regardless of being accepted; this poses a barrier for those ready for next steps. So, would Valbuena successfully complete the intermittent steps necessary in a college transition or would his family’s financial situation limit him from attending college? Verde Magazine first interviewed Valbuena for the cover story in our fifth issue last year. At that time, he told us that he was determined to fulfill his dream of being the first to attend college in his family. THE START Martha Avila-Zavala and Peter Valbuena, both first-generation college students and Palo Alto High School alumni, sit at their college introduction. Photo by Peter Valbuena Sr.
RISE UP, or Realizing Individual Success in Education for Undergraduate Preparation, is a program that Palo Alto Unified School District debuted over the summer to help students with summer melt. Valbuena and other students were able to use this program as a resource for starting college. Another Paly alum and fellow classmate at Whittier College, Martha Avila-Zavala, was also at risk of melting away. To deal with the apprehension of starting college, she took full advantage of RISE UP. In spite of the help that PAUSD offers its students, Valbuena’s parents, like many others, are scared to send him off, as the first in his family to attend an American college. However, they try to look out for him as much as is possible from their home in Palo Alto. “They have been very supportive trying to help me out as much as they can,” says Valbuena. “However, sometimes I feel they’re trying to help too much to feel more at ease knowing that they still are there as my parents even though I’m not with them. REGISTRATION Peter Valbuena checks in upon arrival at Whittier College in Southern California. Photo by Peter Valbuena Sr. In addition to leaving home, starting college implies lots of other changes, including new opportunities and a different course load. Meanwhile, Avila-Zavala has had a similar experience on her first week with a mix of emotions but has managed to get used to being away from home. Valbuena and Avila-Zavala’s ease in navigating college was due in large part to the efforts of RISE UP and the Paly staff. “I think that the TAs were very helpful in me getting resources to understand the process,” Valbuena says. After going through high school with the help of Paly and its resources, Valbuena and Avila-Zavala felt prepared to actually make it through to the final stretch and escape summer melt. But starting college in a new area can be difficult, especially when you’re the first in your family to do so, as seen with Valbuena and Avila-Zavala. Though it can be difficult to set your own path, the opportunities are endless once you make the leap and start college.